All information that you provide to us is kept completely confidential. It is used ONLY for the purpose that you have intended. Lots of unimportant vocabulary that has no use in real everyday conversations! Difficult structures that made you give up learning! Vocabulary that you could never use correctly in a complete sentence! The students who focus on conjugating the verbs while speaking have some troubles in speaking fluent Farsi. Furthermore, some students use vocabulary words that are old fashioned from over 500 years ago! They themselves get confused the listeners as well! They may feel sad and frustrated because they tried for months or even years and now they can't speak Farsi in a natural way! All their efforts useless, just because they didn't choose the right method! In this course you will directly use and link vocabulary words to create your own new sentences. This course links new Farsi (Persian) words together and enables you to speak automatically, just like a spider that easily knots and spins! Rapidly you will gain confidence in linking new vocabulary words together after finishing each lesson! SpiderFarsi is a step-by-step method. The course takes you little by little from zero to a level that you can easily communicate in all Farsi speaking countries such as Iran, Afghanistan and Tajikestan. Imagine a husband showing her a Harry Potter DVD! Furthermore, there is an audio file you can click on to listen to the pronunciation of the new words and boost your memorizing ability. Here you have another chance to take a look at some vocabulary words you have learned through mnemonics. These words are going to be used in the audio part. To be able to build correct Farsi sentences, you need to be familiar with some rules on how to link words together. In this section, you will see that you can really speak Farsi without any grammar! In this section you will learn some vocabulary words that are very similar to English or other languages. Furthermore, little by little you will be able to easily guess the meaning of some Farsi words by yourself. These give you the best chance to contribute in the conversations and create sentences. A combination of imagination and fun is used to create these files in the most effective way. Many words can be studied again in the audio files. In addition, you will learn some new vocabulary words unconsciously. Consequently, at the end of this course you will realize that you can use and understand Farsi words. However, you did not learn them through mnemonics! This is the magic of the mp3 files. You can listen to them as many times as you want. In the traditional Farsi classes you have no choice to review the lessons! Furthermore you have the opportunity to listen to some vocabulary words in the Farsi songs designed in the audio files. These songs are carefully selected from among thousands of Farsi (Persian) songs and contain the new vocabulary words of the lessons you are currently learning. So enjoy the songs and simultaneously learn Farsi! 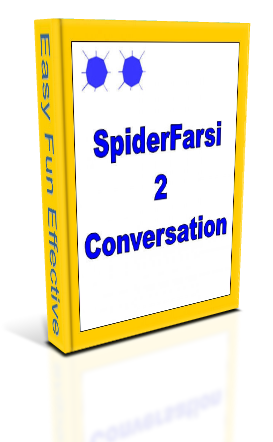 SpiderFarsi 2 and SpiderFarsi 3 each contain 30 lessons, so 60 lessons in total. Each course consists of 2 parts, 15 step-by-step lessons - just like those in SpiderFarsi 1 - and 15 listening lessons. One of the most challenging tenses in Farsi and some other languages is the subjunctive tense. This tense isn't used in English (or is less used). It is very tricky for many Farsi learners to deal with this tense. In fact, the subjunctive tense plays a very important role in the spoken language. All commands and suggestions you need in your everyday speech are based on the subjunctive tense. In SpiderFarsi 2, the subjunctive-need-structures that are mostly used in everyday conversations are categorized. So whenever you see these structures you will automatically use the subjunctive tense after them. These are structures such as I want, I have to, I can, I should, let's do something, should I do something, it is important, it is necessary, maybe, if, I forgot to do, I like to do, etc. Using the subjunctive structures and making hundreds of sentences by means of the SpiderFarsi spinning method plus many new words enable you to get the hang of this tense automatically! SpiderFarsi 3 is all about the past tense. In this course there is also a very important challenge to deal with. Besides the simple past tense which is a very important tense for talking about past activities, there is also another past tense named the imperfect tense, which is also very important for speaking like a native Farsi speaker! The imperfect tense makes your Farsi sound real and natural. In SpiderFarsi 3, I will show you how to use this tense correctly by means of some diagrams and stories. Once you get the hang of it you can automatically recognise where to use the right past tense. One of the greatest advantages in the Farsi language is that you don’t have too many verbs to conjugate! However, you need to know how to use the verbs for the different conjugations. But the compound verbs make all of the Farsi language a piece of cake! 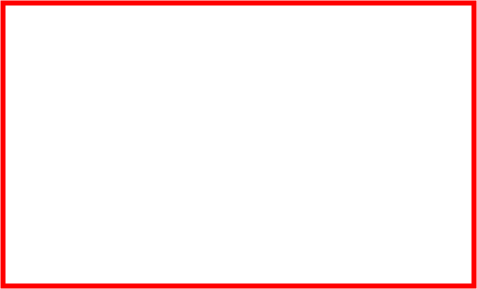 Hundreds of frequently used verbs in Farsi have the verb "to make", "to beat" and "to give" in common. Some of them are shown in the tables below! As you see, you just need to know the present, the subjunctive, and the past tenses of three verbs (to make, to beat, to give) to be able to express the verbs in the tables above and thousands of other verbs in the right tense. Isn't that fantastic?!! SpiderFarsi is the course that teaches you how to learn the complete Farsi language in an enjoyable and creative way and most importantly step by step. Furthermore, some verbs are expressed in Farsi, is sometimes very funny! As an example "to visit" literally means "to beat head":-). We use such funny expressions in the listening stories to make the learning process much more fun and memorable. 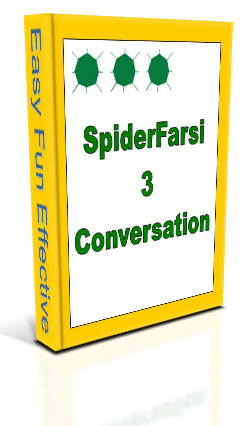 SpiderFarsi 2 and 3 contain 30 listening lessons (15 each). Each lesson includes a story about Usi and his wife, Usia, and their 500 children! They are created very carefully to include the words you have studied in SpiderFarsi lessons. So you have the opportunity to listen to the words in long sentences. This way, you can strengthen you ears and recognize the words and sentences even when a native speaker speaks fast. The stunning point about the listening stories is that they are only in Farsi, without English. And you will understand every single word in the stories! This will give you great confidence to see that you really understand everything. Listening to a complete Farsi spoken story and understanding it deeply is the key to speaking Farsi fluently. In the stories I ask you very simple questions and you just need to listen or answer at the same time I answer the questions. Whenever we bump into an important structure I will make new sentences using new vocabulary so that you can expand your vocabulary (Spinning-Listening Method). To see what I am saying, just download the free lessons at the bottom of this page and find out more about my new method to fluency in Farsi. One of the most destructive things while learning a new language is to confront yourself with stuff you do not understand. I have personally experienced this learning-killing-problem learning English, German, Spanish and French. I call it a kind of poison for learning a new language that stops your learning process and removes your overall motivation. Many students have this problem with online courses, so I carefully designed SpiderFarsi be as easy and effective as possible to follow. But I also offer you a 60-day e-mail mentoring of all your questions to avoid any possible poison! furthermore, you will receive the popular SpiderFarsi weekly Newslettter where you can get informed about others' member questions and new vocabulary words. It will help you stay motivated and positive. I believe if you know your teacher and see that he really cares about your progress, you will achieve success much sooner and easier. Just choose your product and click on the "buy now" button, you will receive the download instruction per Email within 24 hours. If you have any further questions about SpiderFarsi products and your order, please feel free to contact me. I would love to help you learn Farsi.